I am a beginner and I have a question about forehand grip. I played a few times and I found a grip to be resurceful to me. Grip description- roll all 4 fingers normally; but instead of rolling the thumb tightly against any bevel, I put my thumb completely in line with the bevel#1, which is parallel to the raquet string. This creates SPACE within my grip and more stress on my thumb and index finger knuckle, but gives me good control while playing slow balls. This grip weakens and sometimes I lose control when the opponents hit really hard and flat. My observations aside. What advantages/ disadvantages does this grip really have from a technical standpoint? Please educate me. i don't quite understand what you're describing, but if there's any one finger i'd be focused on, with the fh grip, it's the index finger.... for me that's what is guiding the racquet to the contact, and giving me feedback on whether i hit it well. side note: my thumb curls around the handle... vs. lying "straight" on a single bevel. so i can hold on better. Please check this link to see what I am exactly describing. The image has a badminton grip, but you can imagine the same with a tennis racquet. I would discourage you to put your thumb in line with the handle (this is more commonly seen on beginners hitting a 1hbh, with the thumb behind the racquet head while parallel to it). IMO opinion it is a less natural grasping position and diminishes control over the racquet when swinging fast. I've never seen a top ATP player who uses this grip. Just hold a normal grip. right now you're swing slow, and maybe it feels ok, but later, you'll be swinging much harder, and your racquet will fly out of your hands, and kill a small child in the adjacent playground.. I guess you are describing similar grip but 90 degrees apart from what I am saying. Yes, what you said works sometimes for backhand. But please check this image link where you can find what I am trying to explain. 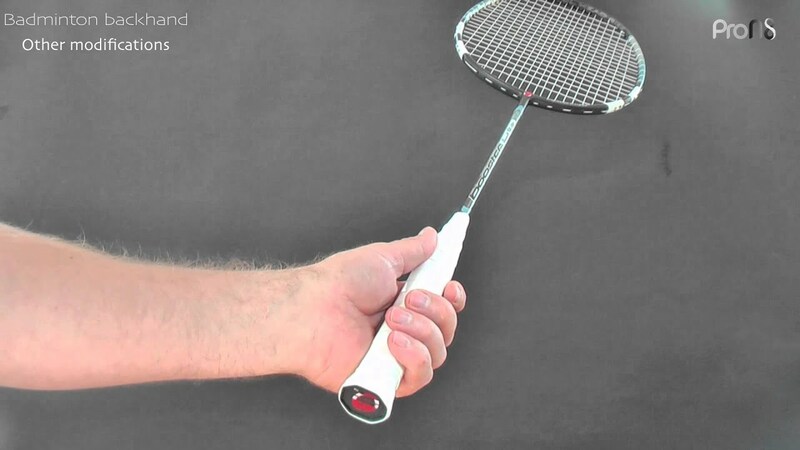 The image shows my forehand grip for a leftie. In the image it has a badminton racquet but I think you can understand what I am saying. Just imagine the same with a tennis racquet. Thinking about it, the only guy who does wonky things with his hands like this on the forehand is Richard Gasquet. Three points: 1) I think Gasquet would have a better forehand if he wasn't doing weird things with his fh grip, 2) Gasquet has a very customized racquet handle which keeps the racquet from flying out of his hand and killing small children, and 3) Gasquet is a tennis prodigy who hit better than normal humans at a very young age. I think he would be more successful if someone had convinced him to make his fh less eccentric. I did not know he has a crazy forehand grip, but surely the FH shots are loopy with no power. His backhand, on the other hand, a treat - delicious. In my case, I am not timing well while using a western grip. Semi-western works OK for me. I have been playing only for 3 weeks now, without a coach. May be that's why I am unable to time well with western grip.